Chinese Dreams: Freedom, Democracy And Clean Air : The Two-Way Chinese leaders and the state-run media keep talking about the Chinese dream. So NPR's Beijing bureau asked the Chinese to define their dreams. Here's what they said. 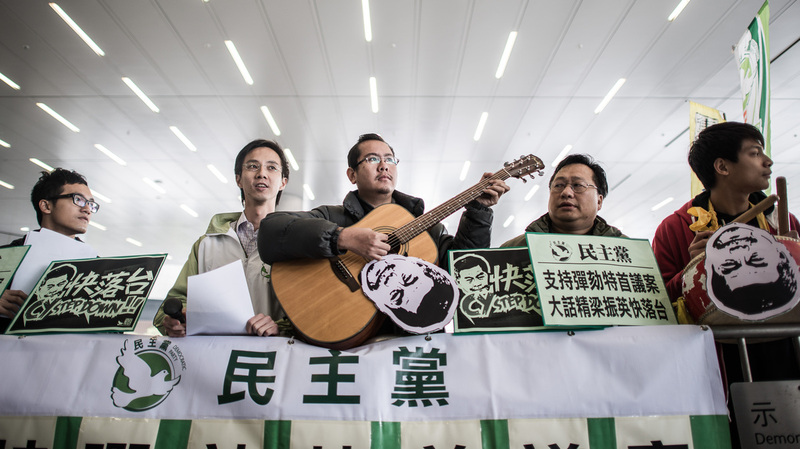 Pro-democracy supporters in Hong Kong sing and shout slogans during a January protest. Chinese leaders and the state-run media are now speaking often of the Chinese dream, though there's no real consensus on what it means. "What is your Chinese dream?" With Chinese leaders and the state-run media now talking about the notion of the Chinese dream, we posed this question on our NPR Weibo account. In China, Weibo is the equivalent of Twitter. Within several hours, we received more than 100 replies. Looking over the first 100 answers, 13 mentioned the word "freedom," including LuP whose Chinese dream was that free people would be able to live their lives freely. For those seeking more freedom, Ziweixiong offered an ironic solution: emigration. Taking that even further, Kongyijun summarized his Chinese dream as becoming an American. Others invoked China's Constitution, which has become an acceptable way of hoping that the government will respect the rule of law. One prominent figure who responded this way was Liu Xiaoyuan, a lawyer who has some 88,000 followers on Weibo and is the legal adviser to dissident artist Ai Weiwei. Liu said his dream was realizing what is in the constitution. Bushuobukuai521 dreams that there will be no corruption and that society will become fairer. Xibeixibeifeng's Chinese dream is democracy. He said that only when the officials stop throwing their weight around will the country have hope. "Democracy" was mentioned 10 times in the first 100 replies. Chen Boge said his hope was of a world without censorship. Every day, he said, he dreams of the death of the "headmaster," a reference to Fang Binxing, the inventor of the Great Firewall that blocks Chinese Internet users from accessing foreign sites like Facebook and Twitter. Many who responded referred to China's polluted environment, high housing prices and the extreme pressure on young people. Wenhuapinji says his dream is to drink clean water, breathe clean air and eat healthy food. Anson-E-Chow's Chinese dream is for people to be able to afford the apartments they live in. Another respondent, EDKGMXRRNYWH, said his dream is to be able to sleep soundly enough to dream properly: He says he wakes every morning at 5 a.m., and doesn't get home after work until 7:30 p.m.
Shennyo's Chinese dream was similar to the one laid out by President Xi Jinping: a prosperous nation, with wealthy and powerful people. But Zhongshengsongxiyang disagreed. His Chinese dream: "Get rid of Marxism, return my China, and the Chinese Communist Party goes to hell as soon as possible." While censors often intervene, this response has not been deleted. Finally, several replies cited a poll asking the same question on a Chinese site. The most popular answer was, "My Chinese dream is that in the future no one will tell me what my dream should be."